V2525. CÉSAR VEZZANI: Vezzani's electrical recordings, 1927-29, incl. Arias from Hérodiade, Samson et Dalila, Les Pecheurs de Perles, Sigurd, La Juive, Otello, Il Trovatore, Rigoletto, Pagliacci, Cavalleria, Tosca & Die Walküre. (France) Malibran 137, recorded 1927-29. Final Copy! "As one of France's most admired singers....[Vezzani] possessed a true t�nor fort, capable of producing very exciting acuti in the performance of dramatic music and, although at his most effective when singing mezzo-forte and forte, he was still able on occasion to refine and soften the tone, in an effort to observe the composer's dynamic markings." 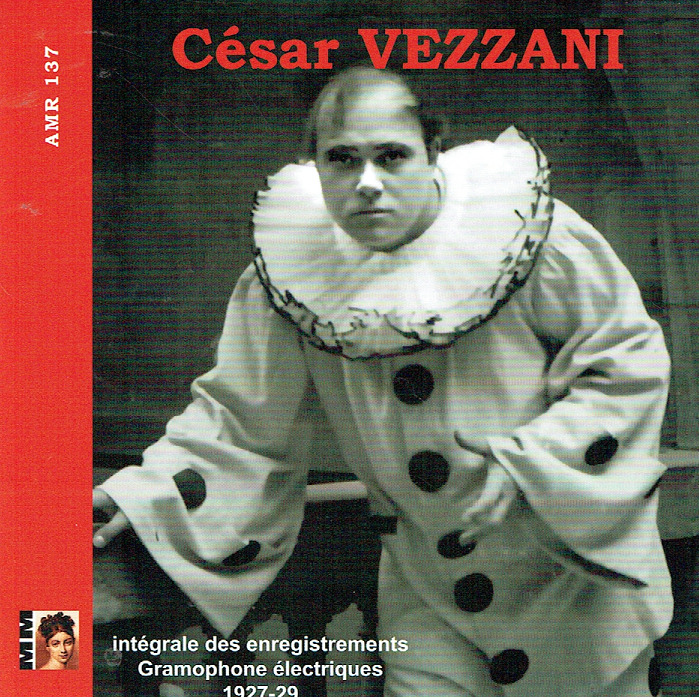 "Vezzani is a truly heroic voice in the best sense of the word. There is not just a secure solidity to the vocal production, but a clarity, a thrilling ring, a command, an excitement and enthusiasm to his singing�.a �must� for all fans of the tenor voice."